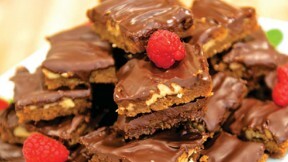 Mom’s Turtle Cookie Squares are a vegan version of my mother’s traditional seasonal recipe. To make the crust, put ½ cup vegan margarine, 1 cup brown sugar, and flour in a high-performance blending appliance and process until particles are fine, forming a loose dough. Pour into a nonstick, ungreased 8 x 12 inch baking pan. Press the dough into an even layer, using your hands. Arrange the pecan halves evenly over the unbaked crust. To make the filling, put ⅔ cup vegan margarine and ½ cup brown sugar in a small sauce pan. Cook over medium-low heat, stirring constantly, until the sugar dissolves and the mixture starts to bubble. Pour the hot filling over the pecans and crust. Bake on the center rack of the oven for 18 to 20 minutes until the pecans are slightly golden.